Like that one guy at the party who just can't take a hint - probably the one whipping out the guitar for a 1am rendition of Wonderwall - the smartphone is increasingly looking like a nuisance to our wearables. But we're slowly breaking free, and having music stored on our smartwatches and fitness trackers means one less reason to take the phone along for the ride. There are two ways to listen to music on the Fitbit Ionic: third-party apps or loading your music directly through Fitbit's software. If you're in the US, Pandora Plus and Premium users will be able to sync their stations to the watch. For those of you in Europe, well, we still don't actually know, and it might be a little longer before Fitbit secures a partner. But if you're not a Pandora user, or live in Europe, fear not, because you can simply load on your music files to the Ionic. There's 2.5GB of space for you to fill with your favorite tunes, and we're going to explain how. Note that you'll need the music files themselves on your computer; you can't just sync your Spotify playlists, for example, though we hope that will one day change. Here's how to get music running on your Ionic. Fitbit's offline playback is limited to working with iTunes or Windows Media playlists, so you won't be able to just pick individual tracks from the Fitbit Connect. Before you do anything else, make sure you have some playlists made and ready to go. To transfer music, you need to download an actual program on your actual desktop computer. Yup. Setting up and using any Fitbit device can all be done with the smartphone app, so there's rarely a need for Fitbit to nudge you towards the computer. 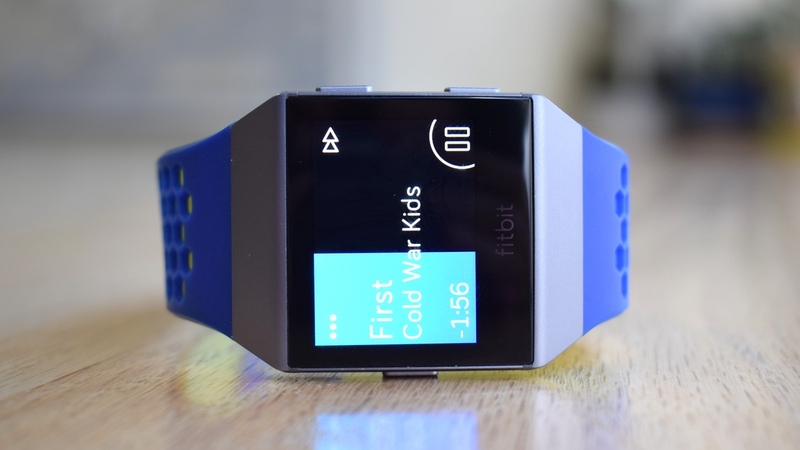 But you'll need to download Fitbit Connect, Fitbit's desktop software, which you can find here. Side note: You can also use Connect to sync your Fitbit tracker with your account, or set up a new device. Once you've downloaded it, boot it up and click the 'Manage my Music' button. You can also jump straight to the music manager from the Fitbit toolbar app. You can only transfer music to the Ionic if it's sharing the same Wi-Fi network as your computer. Annoyingly, you can't do a simple drag-and-drop by plugging it in. Chances are you probably did this when you set up the Ionic, but if you didn't, you'll need to go into the smartphone app, tap on your Ionic device, and scroll down to Wi-Fi Settings. This will let you add a new network, and also show all of the Ionic's saved networks, in case you want to see what it's already defaulting to. Once both the Ionic and computer are on the same network, they can talk. Next you need to open the music app on the Ionic - that's the purple one - and then you need to scroll down and hit the 'Transfer Music' button. You also need to hit the 'Manage my Music' button on the desktop Connect app. You'll then see a spinning wheel as it tries to connect; once it's ready, it'll display a 'Ready to Transfer' message. Once the two are talking, the watch will change to tell you there's a transfer in process, and the desktop app will show you your music catalogue. On the Connect app you should be met with a list of your Windows Media/iTunes playlists. You can click on them to see what tracks are in each, but you can't edit them from Connect, meaning you'll need to sync them in their entirety, or not at all. Doing that is as simple as just hitting the circle so that it shows the purple tick, at which point Connect will start automatically syncing. Along the top you'll see a bar segmented into different colors to show you how much space is taken up by your offline music (purple) and Pandora stations (blue). Once you're done, as it says 'Transfer Complete' along the bottom, you can safely hit 'End Now' on the Ionic screen. If you did everything right, the Ionic music app should now show you a list of your saved playlists. Just tap on one and choose any track to play, or hit 'Shuffle All' for a lucky dip mega mix of all your music. Of course, you need to pair some headphones too. You can do this by going into Settings, scrolling down to Bluetooth and hitting 'New Device'. Make sure your headphones are in pairing mode. Fitbit has launched its Flyer headphones in time for the Ionic, but the Ionic will pair with any other Bluetooth headphones as well. If you've paired multiple headphones to the watch, you can tap the three-dot icon in the top left of the screen when listening to a track and then tapping the 'Device…' button. Scroll down to audio output and you can choose which headphones you want to use. Congratulations. You're now listening to music on your Fitbit Ionic. Who needs smartphones anyway? Go into the Fitbit smartphone app, tap on the Ionic and then hit 'Apps'. If it's not already, install it to the Ionic by hitting the little Install button on the right. Then go back to the Ionic settings page and tap 'Media'. Under Services, select Pandora, then follow the instructions to log into your Pandora account. Once paired, you can tell Fitbit to either auto-sync your three most played Pandora stations, or choose from popular workout stations. You should try Musconv tool. It is really well for transfering music.